After travelling for three-and-a-half years, the Japanese spacecraft Hayabusa-2 this week makes its final approach to the asteroid Ryugu. The probe will release landers on the space rock's surface later this year, bring back a precious sample to terrestrial labs in 2020, and it is already giving planetary scientists their closest-ever view of a mysterious kind of asteroid. The Japan Aerospace Exploration Agency (JAXA) last week released grainy pictures from a distance of around 300 km away, revealing that Ryugu — an asteroid of a common but little-studied type — looks similar to a spinning top. This week, a much more detailed picture, from 40 km away, showed a surface strewn with large boulders. Hayabusa-2 will continue to inch towards the asteroid until it is about 10 km away, which JAXA expects will happen around 27 June. Ryugu’s orbit cuts between those of Earth and Mars. “From a distance, Ryugu initially appeared round, then gradually turned into a square before becoming a beautiful shape similar to fluorite, known as the 'firefly stone' in Japanese,” project manager Yuichi Tsuda said in a 25 June statement. Launched in December 2014, the probe is the follow-up to — and near-clone of — Hayabusa, which explored the asteroid Itokawa beginning in 2005. Hayabusa was the first mission to return an asteroid sample to Earth. Ryugu is about 1 km wide — about 3 times wider than Itokawa but 4 times smaller than the comet 67P/Churyumov–Gerasimenko visited by the European Space Agency’s Rosetta probe between 2014 and 2016. Ryugu is a 'C-type' asteroid, which has a darker surface than does Itokawa, an 'S-type' asteroid. In 1997, a NASA mission called NEAR Shoemaker made a fly-by of a C-type asteroid called 253 Mathilde, from a distance of more than 1,000 km. Hayabusa-2 is the only spacecraft to have got this close to a C-type asteroid, which makes it especially exciting, says Lucy McFadden, who worked on the NEAR Shoemaker mission. 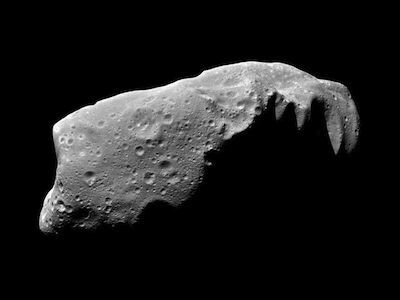 “We don’t know much about C-type asteroids,” says McFadden, a planetary scientist at NASA’s Goddard Space Flight Center in Greenbelt, Maryland. 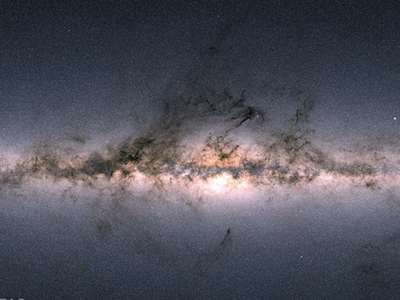 But they are expected to have a composition similar to that of the early Solar System. In particular Hayabusa-2 will determine whether the darkness of Ryugu's surface is due to it being rich in carbon — as is often assumed — or to small, metallic particles such as magnetite. Chemical and isotopic analyses of the rock — to be done in space by Hayabusa-2’s landers and then in terrestrial labs — could help to explain the origins of Earth, and particularly its water. Many researchers think that Earth’s oceans formed from a bombardment of water-rich asteroids or comets. Among the first measurements Hayabusa-2 made was of Ryugu’s rotational period, or time it takes to make one turn on its own axis, which is about 7.5 hours. This is good news, because a much faster rotation could have made it harder to approach the surface, says mission manager Makoto Yoshikawa of JAXA’s Institute of Space and Astronautical Science in Sagamihara. But its shape was surprising, he says, because it has a bulge around the equator, something that is usually associated with much faster-spinning objects, Yoshikawa adds. Hayabusa-2’s most important task right now is to pinpoint its own position using laser ranging so that it can manoeuvre accordingly. “We want to know the exact distance of the spacecraft to the asteroid,” Yoshikawa says. Also crucial is to map the asteroid surface using its on-board camera and infrared spectrometer. Temperature variations, in particular, will hint at the composition of the surface. 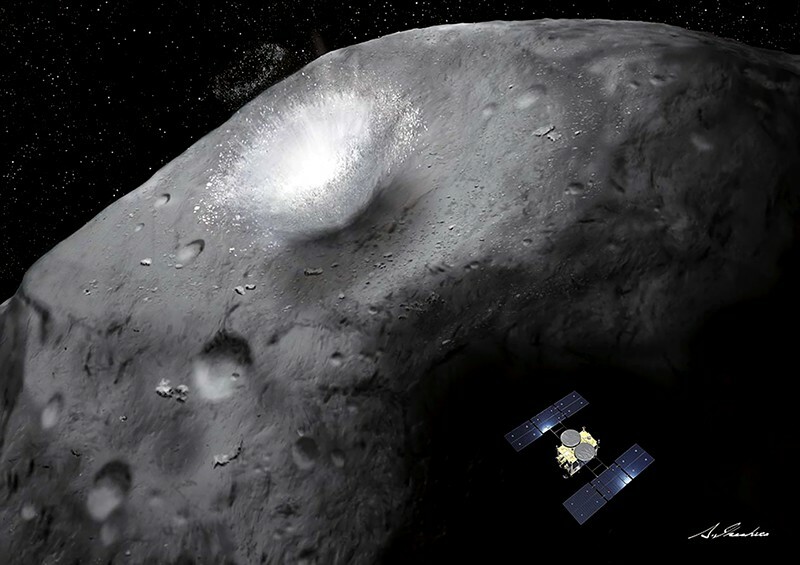 All of these data will be crucial for deciding where to release MASCOT, the shoebox-sized lander that will probe the asteroid, and the three other small probes carried by the mothership, which will photograph the asteroid as they roll across it. “We will use the information we get from the mother spacecraft to do landing-site selection,” says MASCOT payload manager Stephan Ulamec of the German Aerospace Center in Cologne. Ulamec was also project manager for Philae, a washing-machine-sized probe that Rosetta released onto the surface of the comet 67P/Churyumov—Gerasimenko. That approach took several hours because Rosetta was orbiting the comet and Philae had to spiral down to its surface. MASCOT carries no solar panels and is expected to last only a few hours before its batteries run out. “If we fall into a crevasse, or if we are between two boulders, the self-righting mechanism will not work,” Ulamec says. The team will meet in Toulouse, France, in mid-August to make the final selection for the landing site of MASCOT and its companion landers. 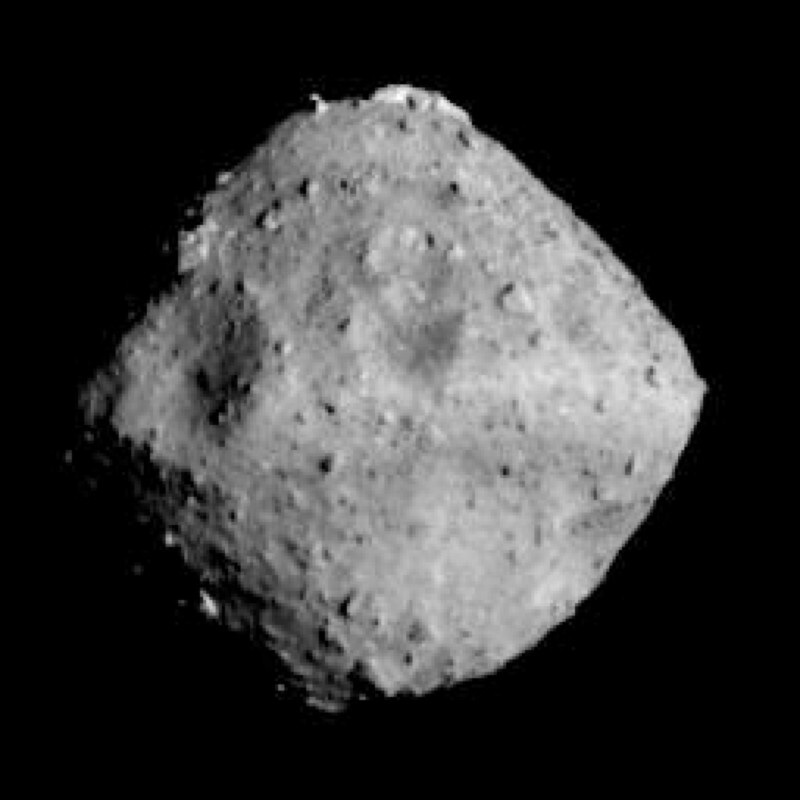 Update 27 June 2018: On 27 June, JAXA announced that Hayabusa-2 had reached its ‘rendezvous’ with Ryugu. The spacecraft’s chemical thrusters performed an automated braking burn, which put the probe into its hovering position 20 kilometres above the asteroid.